In September 2017 we were contacted by MAXXI – Museo nazionale delle arti del XXI Secolo to design the identity for the exhibition “Gravity. Imaging the Universe after Einstein”, hosted from December 2017 to May 2018. Among the others, the exhibition showed Cosmic Concert — The Tuning Illusion, the work by the Argentine artist Tomás Saraceno. Cosmic Concert — The Tuning Illusion describes the flow of cosmic signals in which we are immersed and that reach us through harmony or dissonance. The artist visualizes cosmic dust to make clear to us the inaudible, albeit perceivable frequencies, gravitational waves, and darkness in which we are immersed. Visitors interact with the installation becoming part of the concert in which sound, vibrations and visual signals interact to give life to a cosmic symphony. The purpose of the immersive installation was to make comprehensible the invisible and intangible cosmic fabric of the universe. To explain and complete the installation, Tomás Saraceno conceived some texts as a means for the audience to understand the research carried out by Studio Tomás Saraceno and te Aerocene Foundation. As it is often in our approach, we saw in these texts an opportunity to say more than a basic booklet should say. 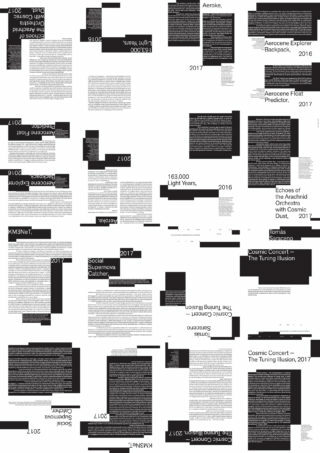 In the graphic identity for the exhibition, and in the specific context of this project, we imagined to destroy the grid system of the typography and we hypothesized to make it flow the contents in a sort of cosmic void — but very controlled. The opportunity was to make this very long texts more accessible to the visitors, so the graphic design should have been very close to the content, saying more and remaining as an object beyond the end of the exhibition. This booklet is in fact a poster folded four times and contains texts written in dual language (English and Italian). To make the contents clearer we designed the dual typography with the figure and the bottom in the opposite way, on black and white.